LORD, ARE YOU FOR REAL? Life is full of questions. Heaps of ‘em. Throughout the Bible, we see curious people. People like Abraham, who dared voice their uncertainties. And because of this, we get answers to questions we sometimes are not aware existed, jumping at us from the pages of God’s word. The disciples are very good examples of curious Toms, they always asked questions. Almost every time they showed up, they were asking questions. Granted some of those questions seemed silly – in hindsight, since we would have asked worse – and sometimes even got some chiding from Jesus which was almost laughable (almost? 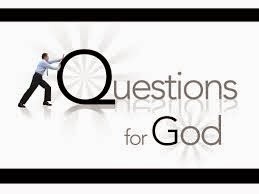 ), but their questions, as well as others’, allowed us the grace to see more into the person of Jesus and have answers to our silent questions. Sometimes when I read my Bible and I see the depths and lengths people went with God, I start to wonder, “Is this for real? Are these people human? How can someone trust and believe God so much as to still the sun? Or part the sea? Or wait on him for forty days and nights without food or drink? Or brave a boiling cauldron for his name sake? Is it real?” And when I get in this mode, I get scared. How DARE I question God’s holy word? But like me, I know many of you have gotten to that point where you risk to ask. Of course, rocks forbid it if you dare voice it out so brazenly, like I just did. No, it’s more like a wisp of a whisper on the far outskirts of your very subconscious mind. So, that is why I’m here; to give that fighting whisper a voice and make you ask the questions you’re scared to admit you have. At your service *takes curtsy*. Back to the question. Is Christianity real? I don’t mean the kind of Christianity you fill up on your legal forms. Or the one where you to doll up in your Sunday bests. Nope. I’m talking about the kind described in Hebrews 11. The kind that was displayed and described by Jesus for 33years or so. The kind that made men and women lay up their lives. The one which requires one hundred percent holiness. The rough, narrow path. Yeah, that one. Is it real? Now, I’m very aware that you wouldn’t ever dare to ask such. But then again, you’re not the one asking right? Those times when you rise and fall so hard you’re sure you bear bruises to tell of your erratic, feeble steps. Those times when you’re so weak and worn you feel you can’t fight anymore. Just want to give up. Those times when the frustration of your in capabilities squeezes your throat so firmly that you’re forced to let out the words; “What is wrong with me? Why can’t I get it right? Why can’t I just do what God wants?” and before you know it, you start to rationalize that after all you HAVE tried. Really tried. Really REALLYY tried. So, the problem couldn’t possibly be you. You think, “It’s a sham! God really wants us all to go to hell. If not then why would he set such high standards? Maybe he just needed a good excuse to do so.” And I honestly make an outraged gasp on your behalf. I mean you would NEVER say something like that. Right? But you would be shocked in just how many ways you silently scream these questions. “When the disciples heard this, they were utterly puzzled [astonished, bewildered], saying “Who then can be saved [from eternal death]?” But Jesus looked at them and said, “With men this is impossible, but all things are possible with God”. (Matthew 19:25-26. AMP). How is this possible? Is this real? I hope you realize by now that the disciples did NOT get scolded for that question. No, they got a very perfect, very famous answer. With men (you) it is impossible. Unreal. But with God not just that, but ALL things are possible. And real. I know this is all sounding fine and dandy right now and when you get out there, you find yourself in the world where you don’t belong, trying, REALLY trying to live. But it gets hard. All your good intentions turn to pulp under the weight of the world. Trust me, I know. Jesus didn’t say it would be easy. It’s hard. But it’s simple. Christianity is REAL. It is life. As real as the air you breathe. You don’t see it (air). You don’t know whether it contains some gooey green bugs. But you believe there is life in it. So you breathe. Not consciously, because it’s a part of you. You don’t think about it. You don’t try so hard. You just breathe in the invisible air. Christianity is as simple as that. God made it all so simple that we tend to complicate it in our vain wisdom thinking, “No, c’mon, it has to be more complex.” (We’ll talk about our tendencies towards complications later). No, it’s simple. It’s the simplicity that makes it so hard. So when next you want to ask if Christianity is real, remember to BREATHE! Side note: I honestly don’t have answers to your questions. I just want to encourage you to go to Him who can answer them all. Don’t worry, you haven’t sinned if you ask. For God to say His people perish for lack of understanding, means he expects us to ask questions. Now, I said ask. Not doubt. There's a huge difference between asking God questions and questioning Him. So, what questions have you been asking?